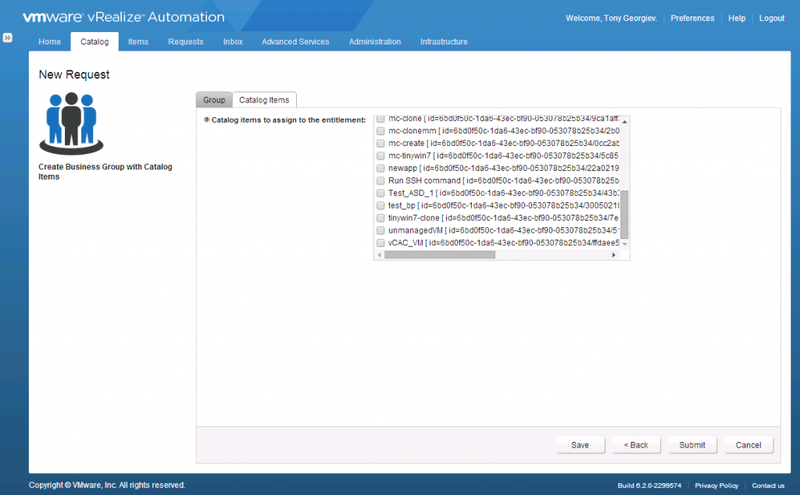 The good thing is that all of the above operations have their corresponding vRO workflows and scripting action delivered by the vCAC plugin and all of the workflow activities can nicely map to the manual steps. 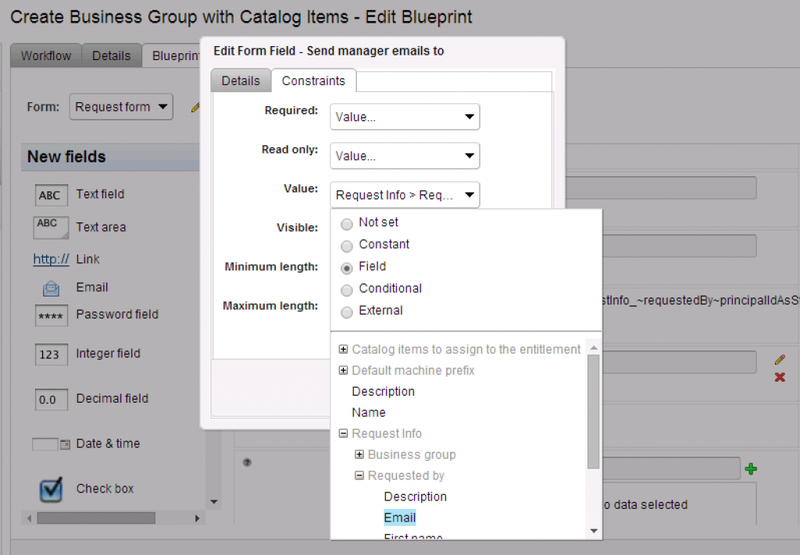 Lets create a workflow, we will name it “Create Business Group with Catalog Items”. The first thing to do on the empty workflow, would be to drag a new workflow and from the workflow chooser to choose the “Create a business group” workflow. 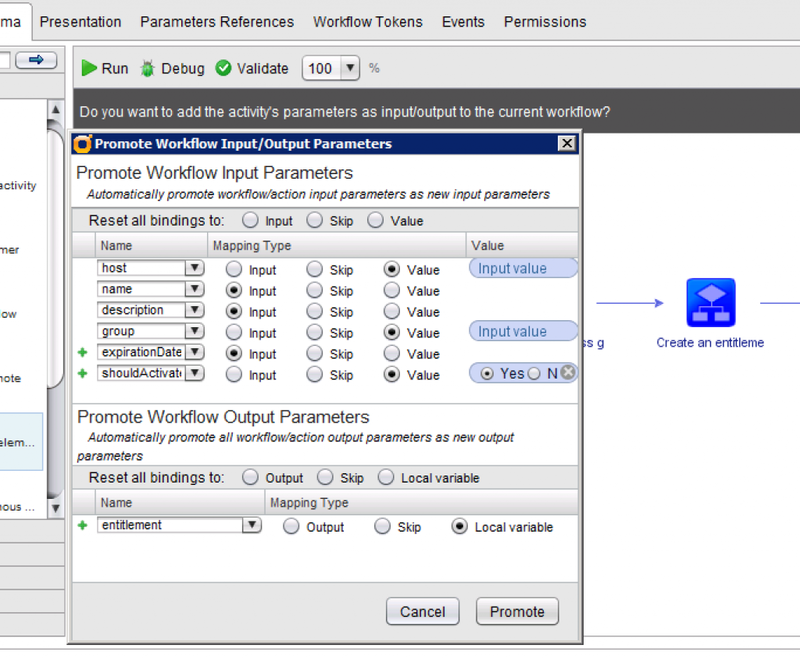 When the workflow is added, we click on “Setup” to promote it’s inputs and outputs. You can select what bindings to promote to inputs, but the most important we can note here are: name, description, defaultMachinePrefix, administratorEmail and users. Others are either skipped or a value will be assigned to them as an internal attribute. You can notice that the administrators input we have bound to an attribute. 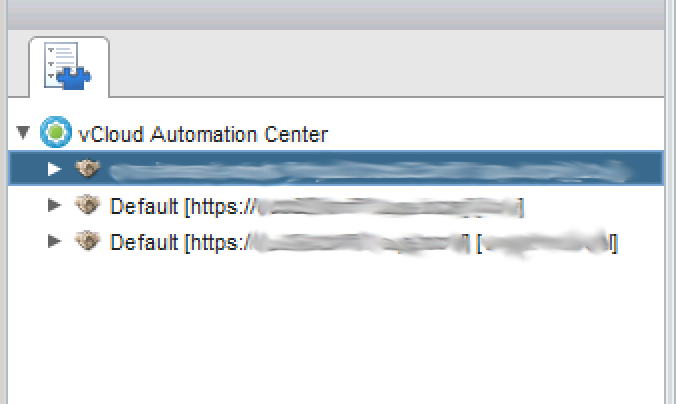 This is because for our solution we will allow only single administrator – the one requesting the end Catalog Item. This is why we will add an intermediate scripting action that from a workflow input administrator will return an array with this value as a single element. Next if we follow the steps from the UI scenario, we have to create an entitlement. 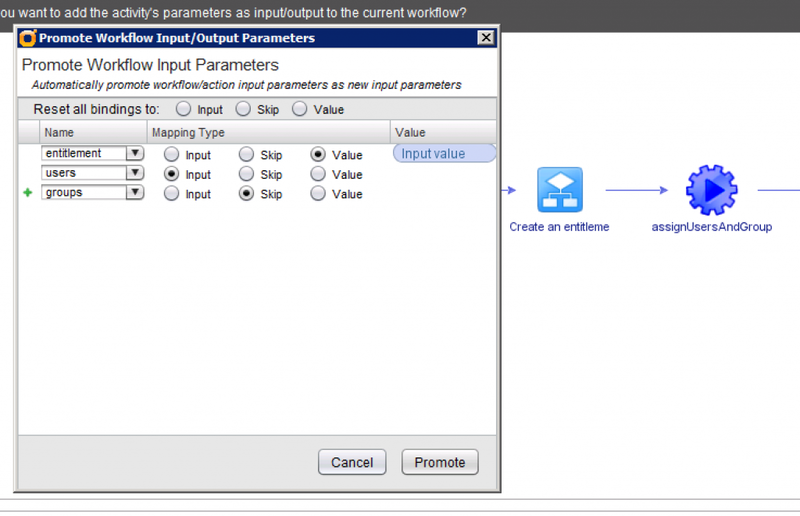 We drop another workflow element and select the “Create an entitlement”. We open the bindings editor again. A lot of the inputs are automatically bound to the items that were created from the previous workflow. 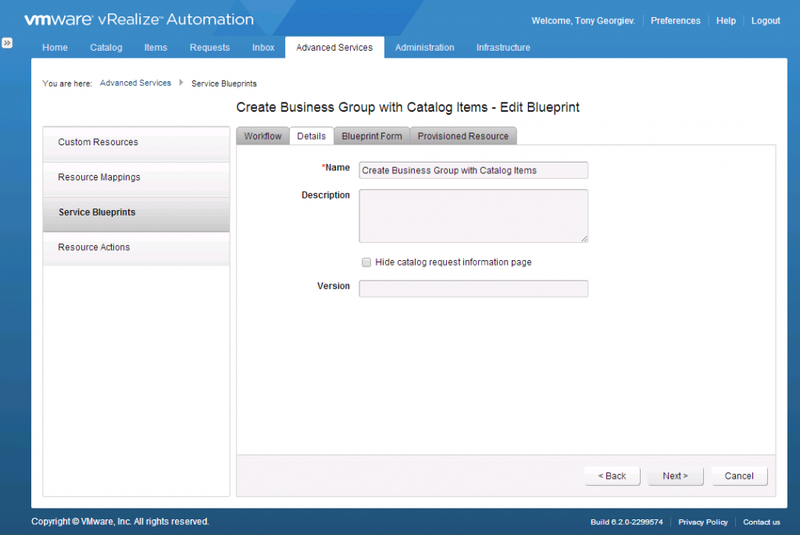 The input for the business group is bound to the result of the “Create a business group” workflow. This action also accepts groups, but for our scenario we will skip them and bind only users and entitlement. And as a last item we will include the “assignCatalogItemsToEntitlement” scripting action. For the entitlement, we use the result from the previous workflow. 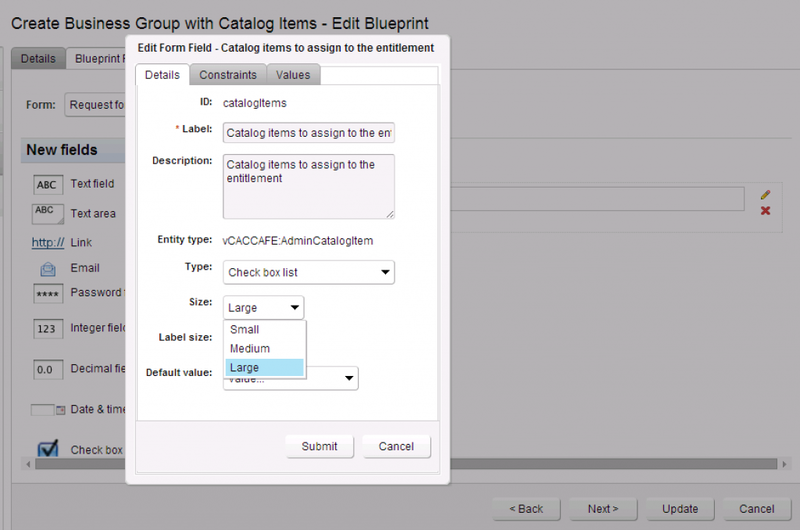 We will expose the catalogItems as a workflow input so that the user can select which items to entitle. We will skip the approvalPolicy, but you can use it based on your requirements. 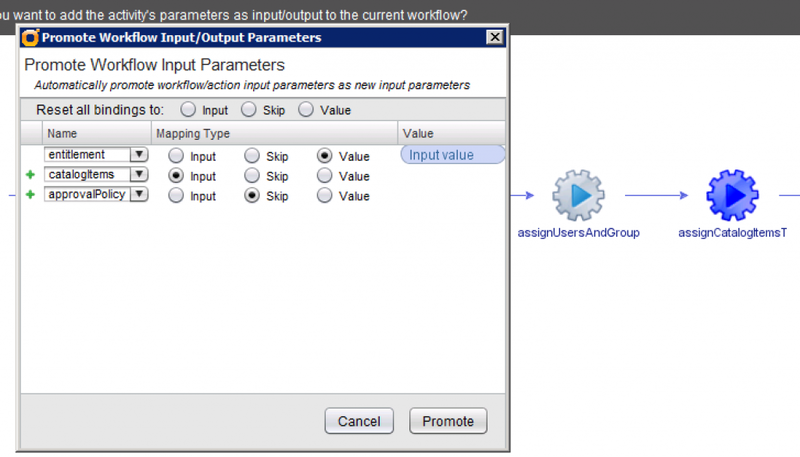 The attributes administrators, group and entitlement will be populated in the execution of the workflow. The shouldActivate is marked as true, as we want the entitlement to be active. For the host we will select a VCACHost from vRO’s inventory. 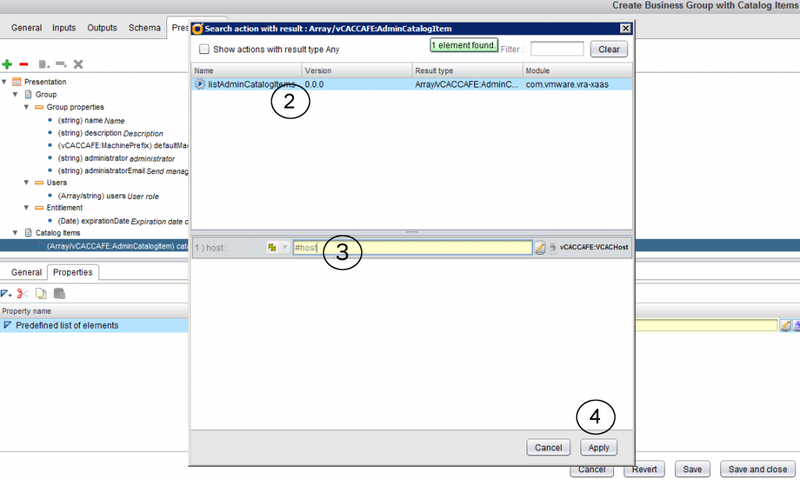 Make sure you have added hosts using one of the “Add a vCAC host” workflows. At this point we can go and create an ASD blueprint from this workflow that is fully functional. 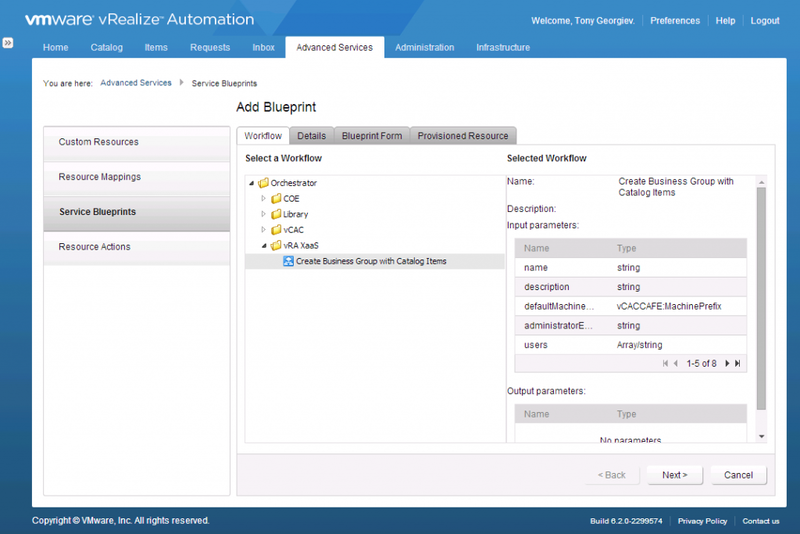 For this purpose we need to navigate to Advanced Services > Blueprints. Click on create a new blueprint and follow the wizard. Next you will see that we have one nice auto generated form, you can modify anyway you want, but the default configuration is enough to save and publish the blueprint. This is the minimum requirements we need to create a single page wizard that combines the inputs of few different screens from the product and allow us to run a set of operations with a single click. 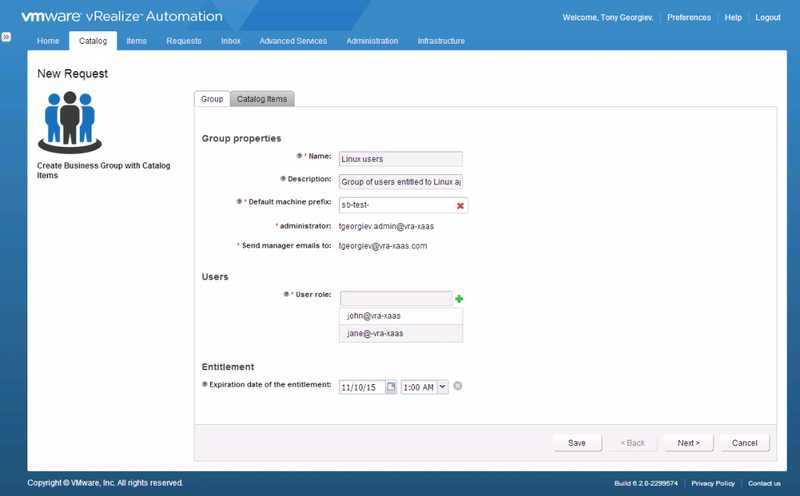 It basically calls vCAC’s Catalog API to retrieve the Catalog items that are not associated with a specific business group and orders them by name. It returns only the first 100 items, you may want to increase it. But have in mind that 100 items are a lot, so you may consider using an alternative approach to pick catalog items, like using a search component or tree. Next up we will change some visuals. We expect that the name of the catalog items to be long, so we can increase the size of the component displaying them, for better visual experience. We need to open the other form page holding the catalog item. And we are done with the advanced configuration. 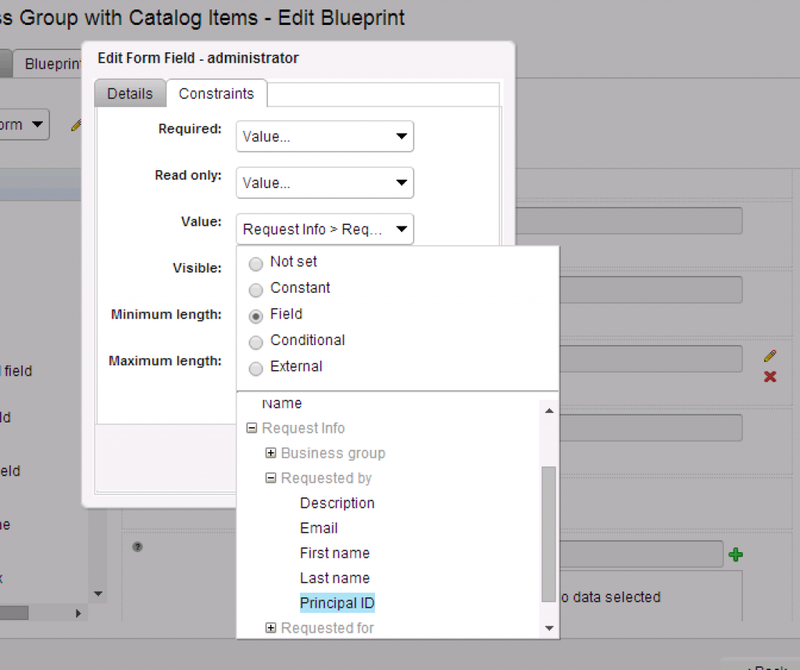 Hint: One idea you can try to implement is to bind the selection of the catalog items list to a details section, so that you show the details about the currently selected items. After assigning to the proper entitlement, we can start requesting the catalog item. You can see how the administrator and catalog fields have been already populated, making it easier for us to fill in the other details. Once we are ready, we can submit the request and after completion open the Business groups, entitlements and user’s details tab to see that everything worked as expected.